These innovations allowed Dr Atkinson to study the impact of political rhetoric in a completely new way. He published his research in 1984 in a book called Our Masters’ Voices. What took him from obscure academic to international prominence was an invitation he received from a television company. He was asked to take up a challenge worthy of Professor Henry Higgins in My Fair Lady. The task was to train a woman with no prior public speaking experience to give a speech at an annual party political conference. The preparation was filmed for a documentary World in Action to be broadcast on ITV. Dr Atkinson applied the conclusions he came to in his research and the experiment was a success. The woman got lots of laughs and won a standing ovation. Such was the impact of the programme, Dr Atkinson received dozens of calls asking him to help them achieve what the woman had done. Dr Atkinson gave up being an academic and became a speechwriting and presentation consultant. Twenty years later, in 2004, he published a book Lend Me Your Ears. In the meantime, Dr Atkinson had had a chance to use his techniques at the highest level as an advisor the then leader of the Liberal Democrats, Paddy Ashdown. The book reiterates his insights, but they are fleshed out with knowledge gained from his work advising clients on all aspects of public speaking. In the intervening time, Microsoft’s PowerPoint software had enveloped the conference theatre like bindweed. The corporate world, and indeed schools and universities, adopted slides as a way to simplify and structure presentations. Dr Atkinson railed against its use and urged people to throw away the ’security blanket’, which confused reading and listening in the minds of the audience – processes which take place in different parts of the brain. What Dr Atkinson says in his works is not new. It provides a fresh angle on the what the Greeks taught us about rhetoric. What is rhetoric? Rhetoric is the skill of putting your words into packages which makes them more easily understood by audiences. How can Atkinson’s theories be proven? They can be proven because he focused on applaudable messages. He shows that by structuring your sentences in certain ways, you can signal to the audience when they need to clap. Getting people to recognise applaudable messages is an important tool in the armoury of the persuasive speaker. After all, you’re generating evidence of a positive reaction. The crowning vindication of the theories was the rise of Barack Obama. Obama made abundant use of the techniques described in Dr Atkinson’s books. Between 2008 and 2014 Dr Atkinson wrote a blog which commentated on the performances of leading politicians. The entire blog was published as a book called Seen & Heard. There is a powerful connection between public speaking and leadership. The theories have several important implications to do with the way we understand what it is to be a leader. What Max Atkinson discovered that ‘charismatic’ speakers used certain techniques to deliver their messages. 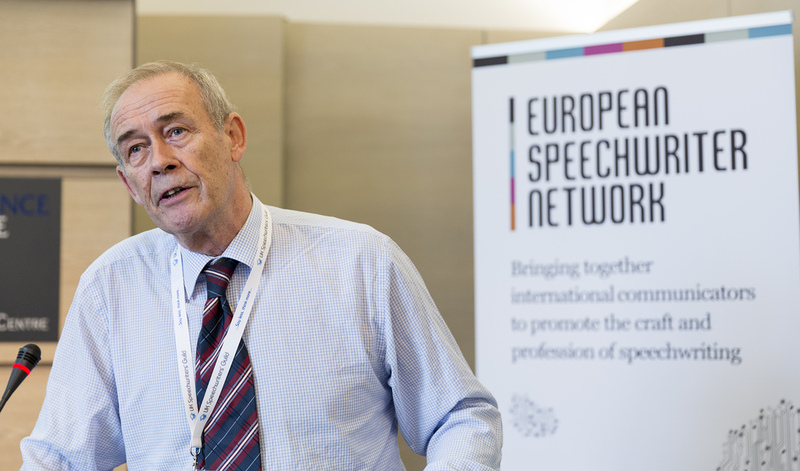 At the UK Speechwriters’ Guild we have immersed ourselves in the principles outlined by Dr Atkinson for many years. We have practised them in our writing and seen them work for our employers and clients. The purpose of our organisation is to disseminate them as far as possible. Let us teach you the ‘language of public speaking’.